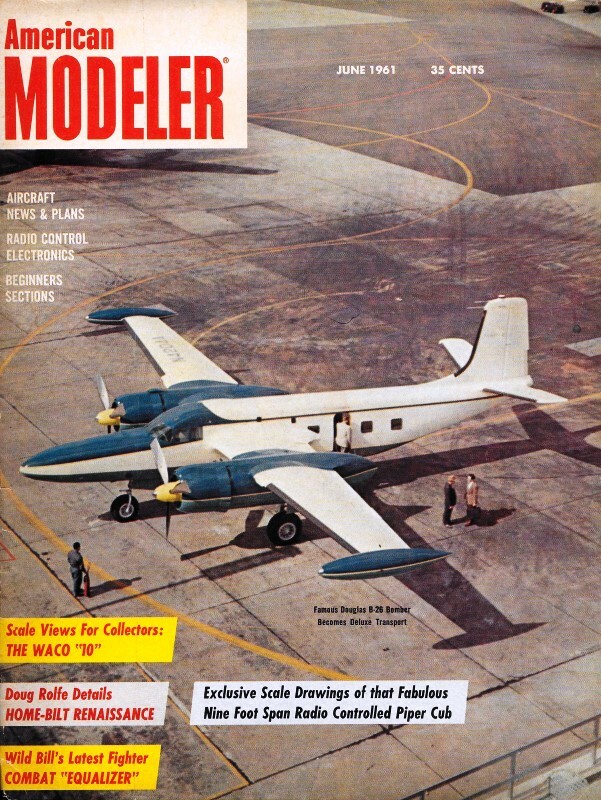 This autobiography by Maximus designer Robert Sifleet from the June 1961 issue of American Modeler is half of a pair of articles that also covers building and flight details of the Maximus. Robert won the 1960-1961, U.S.A. Championship. As with most champions, he began at an early age and progressed with dogged determination into early adulthood. Even in these days of ready-to-fly models that have been thoroughly engineered for successful flight, free flighters - and with a couple exceptions control liners - are still building, trimming, and flying their models themselves. "How I won the 1960-1961 , U.S.A. Championship"
Climax to an outstanding performance during the last American Air-Model Nationals at Dallas, Texas, Naval Air Station: Toledo's Bob Sifleet receives Open Class and Grand National Champion awards from the Navy's Vice Admiral Robert Pirie. Winning "high point" was the greatest honor I have achieved in my 16 years of modeling. The highest goal of any model builder; it is not done with luck alone, by accident or chance. It is achieved by a great deal of thought, planning and preparation. 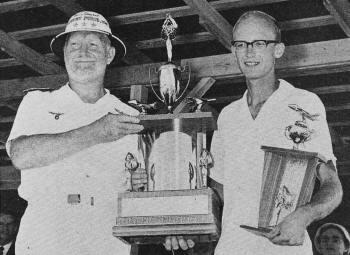 At the first Nationals I attended (1954) in Glenview, Ill., I first became acquainted with National competition and aware of the goals to work toward. Then at the next Nationals I attended (Philadelphia in 1957) I saw the high point awards being given and decided to try and win this award. In 1958 and 1959 I competed for high point and nearly won senior high point. In learning to fly all the events necessary, I have built many models and competed in many contests in all of my selected events - for the practice in flying them. While doing this I won the senior high point at the 1958 King Grange Internationals, and won the scholarship awarded there in 1958 and also in 1959. In 1959 I was a member of the U. S. Nordic team. and was with Jerry Ritz when he scored his victory in Europe. I finally worked out the events I used by the events that I could do the best in with least possibility of anything happening to cause trouble. I flew 1/2A, A, B, F.A.I. F/F as my gas events because these are my best and I fly them a lot. In non gas free flight I flew A/1 and A/2 towline glider and indoor hand launched glider. In U-control I flew stunt and 1/2A speed. In all of my free flight events I used my own design throughout as they were planned to fly consistently under all weather conditions. By the end of June 1960 I had all of my models in readiness and all had been flown in local meets with reasonable success. They had been thoroughly test flown as many as 30 to 40 times under all conditions. In preparing to leave for Dallas I packed my models in a box and placed it on a carrier on top of my car which has vacuum cups as well as the conventional straps. The lid is held on with wood screws to prevent it from coming off. The entire inside of the box is lined with polyethylene sheet to prevent moisture from getting inside. These precautions were to prevent a lot of hard work from being ruined or destroyed. My brother Laverne and a friend Gale Parker came along with me as helpers and for the trip to Texas. (Without helpers familiar with contest flying, one is at a great handicap.) Both boys have helped and flown with me a great many times in the past years. On Sunday July 24th, we arrived at NAS Dallas, Texas, late in the afternoon after two days of driving from Toledo, Ohio. The first thing we did was to get the models in the work hanger out of the heat and sun and get everything in readiness. I went through the usual procedure of getting my contestants kit, meal ticket and getting set up in sleeping quarters. The rest of the evening was spent in renewing old acquaintances and the usual bull sessions. Along about 11:30 I rounded up my brother and Parker and went to the barracks to get some sleep. This is necessary as it is important to be alert and in the best of condition to do the best possible flying. Monday July 25th I drove to Fort Worth to fly indoors at the Will Rogers Coliseum. I found the ceiling a little low for my hand launched glider; the glider had too much climb and flew into the rafters or hit the sides of the domed roof. However, I got a flight of 52 sec. which was fair compared to the top time of 1:02. On Tuesday July the 26th early in the morning I flew one test flight on my class B free flight model which appeared to be going good. In waiting for a good time to fly I noticed that there was little or no ground lift and conditions very weak aloft. As the temperature began to climb the conditions did not seem to get any better so I decided to fly. On the first flight the model got up okay but no lift was there. She went out of sight in 3:51 behind the hangar. The next two flights were maxes so the total was 13:51 as compared to 14:31 high time, but it was good enough for second place. In the afternoon the air was very still and quite hot which made flying A/1 towline glider difficult. I ended up with a total of 8:41 which was a poor showing compared to 11.26 the winning time. Wednesday July the 27th I had one event to fly, 1/2A free flight. The model was given four test flights to be sure of its trim. I started to fly about 10:30 and finished at two o'clock, due to difficulties in retrieving off the base. However, the model did three maximum flights which gave me 100 important points toward high point: This put me in a tie with eight other contestants, and a good fourth flight was needed. I hoped I would not lose the model so it was flown with a 10 minute fuse and dethermalized as it was about to go out of sight. I ended with a total of 28:10 and got my model back thanks to my helpers who chased it. But in competition I only placed 3rd. Thursday July 28th. Another hot Texas day with plenty of holes and I got a few that day. I flew class A free flight and totaled 11:39 compared to 14.35 tops. This was the poorest I have done in class A in a long time. I went ahead and flew A/2 glider, starting off by putting the first flight in the water in 2:58 and breaking the water-soaked wing on the next flight. After a lot of work I finally got 9:07 compared to 12:57 high time. Friday July 29th my helpers and I went out to the stunt circle and put in a flight early as the weather looked threatening. Not being much of a stunt flyer (I had flown the stunt pattern about 30 times) I scored 340 points compared to Jim Silhavy's 417. Later in flying F.A.I. power I hit some more of those Texas holes and did 3 flights of around 1:40 after 2 maxes (I have never seen the likes of that kind of flying weather in my life). Saturday July 30th. With a slight case of nerves I went out to fly my 1/2A speed model. This event would win me the high point or it could lose it for me. In studying the chart of the high point contestants I had been trailing I noted I could now come out ahead if I could score an official flight in 1/2A speed. To be sure of getting a flight in I did not use a hot fuel but one that would assure easy starting and adjustment. After 20 minutes of tense waiting it was my turn to fly. The pen bladder tank was filled and the model assembled. With shaking hands I started to flip the prop and the engine started quickly. The model was placed in the dolly and I gave my brother final instructions for launching. I was ready to fly and gave the signal for release. The dolly accelerated fast and the model came out of it with nose too high almost stalling! I held on hoping this would not be the end of the flight but the nose came down and the model was flying. I counted the laps to be sure it made the required number 1, 2, 3, up to 8, 9, 10. Then the jitters were all gone because I knew I had done it. After landing my helpers said they were sure the model was going to loop initially but it leveled out like it was being pushed by some unseen force. Sunday July 31st. My jet pay load model burned up after coming down with the engine still running (sure glad I had not selected this plane for a high point event). I then watched the other contestants fly. In the afternoon I was paged and asked to report to the model meet headquarters. There I was told to be sure and be on hand when the high point awards were to be given. Yes, I had won with 719 - true some of the performances were not very good by most standards; however, I averaged 80% overall in the events. Perhaps the hardest part of winning is to look into flash bulbs trying to smile when I was dead tired from the heat and exertion of a week-long contest. After I arrived home the local newspaper and every body I knew and some I didn't know kept me busy for several weeks. 1. Select the events you are going to fly and work on these events only. 2. The better the model is built the better it will fly. 3. Be sure that all gadgets and devices work properly 100% of the time. 4. Always be well equipped for all emergencies, especially for a fast repair job. 5. Enter only consistent models that will fly regardless of weather conditions. 6. Have two helpers with you when flying free flight models - one your ground mechanic who stays with the timer, the other to help chase. Retrieving a free flight model in a car by yourself is dangerous with other contestants after their models on the same field. 7. When flying do not hurry, a slight slip could crack up a model as well as lose a free flight. With only one or two flights or missing an event entirely will certainly cut your chances down drastically. With these simple rules I believe almost anyone with the will to do can be a contender and I hope to see more good scores toward high point. Now here's wishing everyone who competes for championship honors good luck as it is always nice to have a little of that on your side. 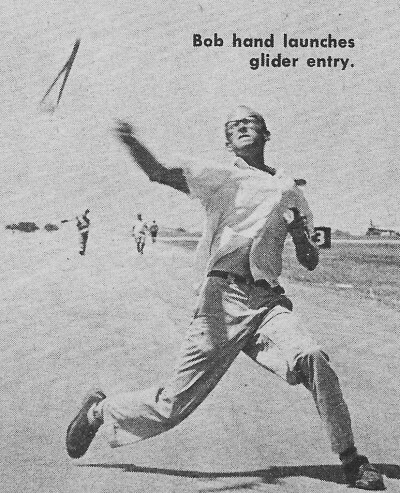 Bob hand launches glider entry. For me it all started in 1945 when I nailed several boards together and called the result an airplane. I tried to build some of the kits that were available at that time that had cardboard formers and what seemed like dozens of basswood stringers. Most of these finished models did not look much like the plans they were made from; the covering usually looked like a wrinkly paper bag. This was probably not too bad considering that I was only six years old at that time. By the time I was eleven years I had constructed most all of the kits put out by various manufacturers, even some solid models. On my eleventh birthday I received an AJ Firebaby with a Baby Spitfire .045 on it. Being my first model engine it was quite a thrill! I practically wore it out running it just to hear it go. Of course, the Firebaby only lasted a few flights, but I put the engine on a Rascal 24 which was my first free flight model. The first contest I flew in was in the summer of the next year at a field about one half mile from my home. (Incidentally I still use the field for flying.) This same Spitfire .045 was in a Mini Hogan 34, which was my extreme effort at the time. This model was not very successful, but I was encouraged by it and became quite interested in contest modeling. 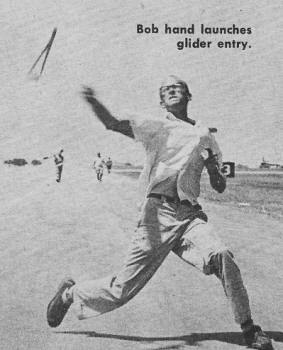 The next year, which was 1952, I built a 1/2A Zeek and flew it at two meets and placed fourth in one, but lost the model in the other. This while very discouraging did not stop me for long. For the summer of 1953 I made my biggest investment that I had put into models up to then. I bought a K&B .19 and built a class A Zeek for it. In June of that year I talked my father into driving me to Flint, Michigan, for a contest. With all age groups combined my father thought winning was out of the picture. On the first flight the model made a six minute flight, which was a max at that time, and came down one half mile away in very tall and un-climbable tree. This presented quite a problem so I called the local fire department. for help, but without success. I ended up waiting two hours for the wind to blow the model down. The other flights were not as good, but good enough to put me in 2nd place, and I received my first trophy. Later that summer at another contest that same Zeek won another 2nd place. However, it met its end in a splintering crack-up that same day. Not to be discouraged I built a 1/2A Kiwi and won my first 1st place trophy in a meet that fall. That season really encouraged me and I became really bitten by the "contest bug." The next year I built a variety of models and tried more events such as hand launched glider, pay load, 1/2A speed, all sizes of F/F gas plus towline glider. I attended quite a few meets and did well in some of them. The highlight of the summer was when two of my modeling friends and I drove to Chicago, Ill., to attend the Nationals. There I spent a lot of time talking to many modelers and picked up a few new ideas. However, in the competition the best I did was 6th in class B free flight Jr. The next three years were filled with a lot of meets; quite a few models were built, then more made to replace lost models. It seemed that I did not have the ability to retrieve long flights at that time. I remember losing four 1/2A free flight models in a five week period. This was hard on the pocket book as my income at that time came from caddying at the local country club. In 1956 I graduated from high school, got a job, and bought a car; this enabled me to have better equipment and attend more meets. At the 1957 Nationals I won 3rd place in class A F/F after a day of flying I will never forget. Around 10 A.M. the model was put up for its first flight, stayed up for over 10 minutes and went about 1 1/2 miles into a dense woods. My father and I hunted for two hours before finding it. The model had taken quite a beating when it came down; the wing was broken in half and had quite a few holes. I did a quick repair job and with only one coat of dope on the half of the wing that had been recovered, it made another good flight. This time it came down about two miles away in a large tree. Getting the model down was quite a problem; this was solved by securing a ladder and carrying it one half mile. When the model came out of the tree it broke the wing tip off and broke again where it had been broken before. I rushed back to the work hangar and made some hurried repairs as there was only one hour left to fly. Fifteen minutes before closing time with the wing braced with string across the top and bottom (it looked like a big indoor model with all the bracing) I flew the model at about 3/4 power and made a four minute flight. I will always remember the flying difficulties I encountered that day. By the summer of 1958 I built several English towline gliders which performed very well, my first Wakefield, also some U-control models. This year I decided to try my hand at the F.A.I. eliminations and on the first try I earned a place on the 1959 Nordic team. This proved to be a good opportunity to meet modelers from other countries and learn some of their methods and ideas. Due to the rule change in 1959 I decided to start designing my own models. After flying both conventional and high thrust models I incorporated the best features of both and came up with the Maximus design. Most of these have flown quite well. It is very satisfying to get good performance with one's design especially in a meet against well tried designs. I still feel I have a lot to learn about designing and consequently make changes in my models from time to time as problems arise. At the 1959 Nationals these original designs did well as I won 1st in Wakefield and 2nd in class A F/F. 1960 was my first year in open ... I thought the going would be rough and it was. I found that there is more and better competition in the open division, and less leeway for error in competition with more experienced modelers. However, my first year in open was the best ever. It started by my narrowly missing a place on the F.A.I. power team. At quite a few local meets I did well and placed in nearly all the events entered. Then came the Nationals, there the Maximus design won two places and did well in two others. I did well in all of the rest of my events and consequently won the National Championship. This was the highlight of all my modeling years. All the work, effort, success, and failures seemed to come together for one great triumph. As I am attending Devry Technical Institute, my time to spend on modeling will be limited for the next two years. However, I shall work on the International events as the time permits and perhaps attend the National meet next year. In the future my efforts will be to contribute as much as I can to modeling, as it is a great hobby. By attending contests one meets many different people with varied ideas. Participating usually involves travel which helps widen one's perspective.